Virtual learning environments could be utilized to boost the development of English language skills among Malaysian primary school students. English Language proficiency has been deteriorating over the years and basic oral skills have been appalling due to lack of usage and reflective practice. English lessons that incorporate multimedia applications can exert powerful motivation and provide bored students with exciting new ways to learn. The aim of this paper is to examine if the newly created Virtual English Language Tool (VELT) could be used to improve the listening and speaking skills of primary school pupils in a sub-urban environment in Malaysia. A Year 5 class used VELT for a period of nine months. Donald Kirkpatrick's four-level model was used to evaluate this e-learning tool. The findings of the case study were quite encouraging. There is a growing concern about the level of English proficiency at the workplace which if left unchecked could cause the country to lose its competitiveness especially in the industry and technical fields. In a 2005 report in Malaysia Today entitled "Malaysia has 60,000 Graduates Unemployed", the Economic Planning Unit of the Prime Minister's Department found that around 60,000 Malaysian graduates are unemployed due to lack of certain skills such as communication skill, poor command of English and lack of work experience (Nurita et al., 2007). From the report it was found that 70% of graduates from public universities, 26% from private higher learning institutions and 34% of those graduated from foreign universities are still jobless (Suresh, 2006). In order to maintain its international competitive edge in all aspects of the economic environment, be it administration, education, trade or finance, Malaysia and workers need improved communicative competence. Almost everyday there are some reports or reference made in the newspapers about the deteriorating standard of English. English is widely used in the private sector and fresh graduates need communicative competence in English. The 2005 School Certificate Examination Report on English Language 2 revealed that the majority of candidates have yet to master writing skills in English at the required level (School Certificate Exam Report, 2005). Year after year, examiners have expressed with great dismay the fact that after having learnt English for eleven years, students in most cases failed to produce even a short paragraph of intelligible writing (Khairiah, 1970). Many academics acknowledge the deterioration in the standard of English Language among primary and secondary school students. The drop in English proficiency standard is a natural process and it would be unrealistic to aim for a level of proficiency equivalent to that attained when the entire school education was in English (Asmah, 1981). There are a number of causes for this deterioration. In 1970, it was stipulated by the Malaysian Examination Syndicate that it was compulsory to pass the Bahasa Malaysia Paper at school Certificate level if a candidate were to be awarded a certificate. On the other hand it was not compulsory to pass the English Language paper. Students both primary as well as secondary took great pains in mastering Bahasa Malaysia. Another fundamental reason for deterioration is the lack of exposure to English and usage of the language beyond the classroom (Fairus, 2003). In addition, students in schools generally find it difficult to maintain their interest in English Language learning as English is not seen as important for their immediate needs other than to pass their examination. Teachers on their part are unable to sustain students' genuine interest in continuing to learn English and to use the language once the examination is over (Hussein, 2002). What is amiss in all of this? Can the right information and communication (ICT) tools enhance English language teaching and learning and quickly arrest the rapid decline? Carmen et al. (2003) say that integrating ICT tools in teaching can lead to increased students' learning competencies and increased opportunities for communication. Studies undertaken by Becta (2001) revealed that besides providing motivation, ICT integration in the teaching and learning of English can lead to higher achievement. An appropriate e-learning tool based on ICT may provide opportunities for Malaysian students to better develop their English skill competencies. In addition to these possibilities, "practice makes perfect" and the authors firmly believe that Malaysian pupils are weak in English due primarily to a lack of practice in using English outside the classroom. Commercial e-learning tools and learning management systems that give guidance and practice in English language competencies are expensive to purchase. Furthermore their content is foreign and not in line with local curriculum specifications and local English variations. In addition, in recent years it is seen that ICT tools such as Yahoo Messenger and Skype are popularly used by pupils. There is also evidence that when instant messaging tools were used for communication between instructor and students, there is improvement in learning (Sotillo, 2005). There is a need in Malaysia to create a virtual e-learning tool at an affordable price, presenting interactive English lessons which could provide the much needed practice for pupils. The proposed tool would extensively make use of either Skype or Yahoo Messenger. Such a tool is easily the Virtual English Language Tool (VELT). The interactive lessons embedded in VELT are guided by the theoretical framework as outlined by the Technological Pedagogical Content Knowledge (TPCA) model (Koehler & Mishra, 2005). 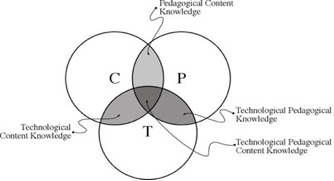 The TPCK model of technology integration in teaching and learning as depicted in Figure 1 argues that developing good content requires a thoughtful interweaving of all three key sources of knowledge — technology, pedagogy and content. Hence, the concept of when, when not and how to integrate technology in teaching and learning English is taken into consideration when designing the lessons so that learning is more meaningful to students. In every VELT lesson, ICT tools are integrated where it could bring benefit to the learner and enhance the learning process. Pictures, sound, tape recordings of vowel and constant sounds, recordings of authentic conversations, pronunciations of difficult vocabulary, appropriate stress and rhythm are frequently incorporated in the lessons. This shift in pedagogy in the VELT lessons could help to boost listening and speaking skills. In normal classroom teaching in Malaysia, much time is spent in teaching reading comprehension and writing. Activities for development of oral skills is lacking. The results of a study through questionnaire and interview by Fauziah and Nita (2002) have consistently shown one main finding—that teaching and testing, both in schools and in the national examinations, focused mainly on two language skills: writing and reading. Listening and speaking have been found to be much neglected in the classroom. This is a major concern as it is through speech that children learn to organize their thinking and focus their ideas (Lyle, 1993). The neglect of oral communication practice in the classroom will hinder such an important language learning foundation to emerge and severely obstruct the development of other aspects of language skills (Zhang & Kortner, 1995). There has been a tremendous growth in the development of Learning Management Systems, Virtual Learning Management Systems and other e-learning tools within the last twenty years that claim to provide training in almost every subject. Some of these learning systems are free while the majority of these systems are commercial. The Virtual English Language Tool (VELT) created by the authors is a free e-learning tool available for Malaysian primary school students. The benefits of e-learning are many and basically e-learning utilizes technology to increase the effectiveness and accessibility of learning (Kruse, 2002a). VELT is a web-based e-learning tool which is uploaded to the server of a selected Malaysian primary school so that all the pupils in the school had access to the prototype tool from the two school computer rooms via the local intranet. For the purpose of this research this particular school is located in Selangor, Malaysia and is referred to as Blimbing Primary School. This means all the students in Blimbing Primary School can make use of this tool. Interactive English lessons from Year 1 to Year 6 are available in this virtual e-learning tool. The school laboratory has broadband Internet access (SchoolNet) and this enables the pupils to access other hyperlinked activities via the lessons in VELT. The infrastructure facilities in the school are good and the 25 computers in each laboratory are each equipped with a headset that includes a microphone. Pupils can carry out audio conferencing sessions with their friends. VELT is an e-learning tool and students could use this tool to complement classroom teaching and learning. This tool is recommended to be used after school hours in the comforts of the students' home. VELT has features of a basic e-learning system and this includes features such as student registration, login, diagnostic test, lesson selection, logout, tutor selection, listening & speaking activities and administrator. Two unique features in this e-learning tool is the 'Book Tutorial Time' for pupils and the 'Display Bookings' module for the teacher. Screen shots of these two important features of VELT are shown in Figure 2 and Figure 3 respectively. Figure 4 depicts the main menu of VELT. A user would first register by filling in his particulars in the registration form. He would then log into the system using the user name and ID generated by the system. The next step is to do a diagnostic test which would determine as to which class he is assigned to. For example if a Year 5 student attains marks below 50, then he is assigned to do lessons in a lower band i.e. Year 4 lessons. Each band or level has 10 interactive lessons and these lessons are further hyperlinked to other quizzes and interactive English lessons and activities in the Internet which are related to the lesson theme. The lessons embedded in VELT are slanted more to developing listening and speaking skills. A list of online tutors together with their photos is displayed in VELT to enable the students to choose a tutor who would give them further guidance in developing aural-oral skills. In the process of doing the interactive lessons the students can make a booking for a one-to-one session with a tutor of their choice. Students would use the Instant Messaging tools e.g. Yahoo Messenger to carry an audio and video conference with a tutor. More and more sessions with the online tutor would benefit the students in improving the oral skills. A number of useful websites are further given to aid the students in independent learning. How Does VELT Enhance English Language Communication Skills? The proposed web-based Virtual English Language Tool (VELT) would provide language practice 24 hours a day and seven days a week. The interactive lessons with hypermedia elements embedded within the tool and the one-to-one tutor support would help to improve the communicative skills of learners. The focus of using this e-learning tool is to improve the communicative skills of students and would-be English language learners in Malaysia. Is the prototype user friendly and can be used easily without any difficulty? Can the respondents use the modules efficiently without any glitches? Are there suitable content materials that meet the needs of the respondents? Does the prototype deliver what it claims to do? Are the tasks embedded in the modules help to improve proficiency in English? Are there activities in the prototype that enhance the oral communication skills of the students? The responses of the students in general revealed that there is overwhelming support for VELT and the modules are easy to use. The majority of the students and teachers (i.e. 90%) strongly agree that the prototype is useful and user friendly. In fact the findings of the evaluation analysis reveal that VELT fulfils the user requirements. The following points pertaining to the usefulness of VELT were stated by the respondents. Being a web-based tool, VELT can be used 'anytime-anywhere' as long as there is broadband internet access. The multimedia elements incorporated in the MS PowerPoint slides make the lesson presentation interesting and meaningful to the pupils. The interactive exercises using Excel, PowerPoint and Hot Potatoes 6 in VELT together with the hyperlinked activities engage the learners' attention and provide powerful motivation to the learner. The Book Tutorial Time Module in VELT provides opportunities for language practice outside the classroom. The audio/video conversation between the tutor and the user using available tools in the Internet is an essential component of VELT and it should therefore be fully exploited by students who have problems speaking fluently. CASE STUDY: USE OF VELT IN A YEAR 5 CLASS IN BLIMBING PRIMARY SCHOOL. Two classes were chosen in this study i.e. a controlled class and an experimental class. Each class had 29 pupils and the average age was 11 years. Each of the classes comprised 15 males and 14 females. In the controlled class, normal teaching was conducted and ICT integrated activities were not done. Pupils in this class rarely used the computer laboratory as part of their English lessons and did not use VELT. In the experimental class, the use of VELT had been carefully demonstrated to the 29 pupils. Blimbing Primary School is located in a small town and most of the pupils in this school come from suburban areas. Pupils first filled in the registration form and upon completion they were able to gain entry into the system. Once the registration had been completed, the pupils were asked to do a diagnostic test and subsequently press the submit button. The diagnostic test marks were accordingly recorded in the system's database. The students next were advised by the tool to choose the appropriate band or class and follow the lessons. The lessons in VELT are in the form of PowerPoint slides and the web addresses given in the slides are hyperlinked to other language learning activities and interactive exercises in the Internet. An interesting feature of the lesson is the appropriate integration of ICT tools in the teaching and learning activities. Copies of the VELT lessons were put in CD-ROMs and given to all the pupils so that they can run the lessons at their leisure at home. In addition to this, pupils had to download either MSN Messenger or Yahoo messenger and have either a MSN or Yahoo e-mail address. The students who have broadband facilities such as streamyx were encouraged to install Skype which includes audio and video conferencing facilities. After having completed a lesson or two that included hyperlinked activities in the Internet, the students who had booked tutorial sessions would go online at the prearranged time and date. An audio conversation that ensued between both parties i.e. between the tutor and the pupil would focus on the needs of the pupil and this is predetermined through the Booking Module. The online audio conversation is an essential element of VELT and it a hoped that frequent tutorials would result in improved oral skills of the student. VELT therefore provides adequate aural-oral practice to the learner. In order to carry out an audio conversation there is a need for the pupil to have a headset with a microphone. Pupils used VELT for a period of nine months i.e. from 1st February 2005 to 30th October 2005. Kevin Kruse (2002b) says a classic way of evaluating an e-learning tool is by using the Kirkpatrick's model. Thus, in this research study Donald Kirkpatrick's adapted model of evaluation as depicted in Figure 5 was used to evaluate this VELT. Following the principles in this model, the target Year 5 pupils were each given a small notebook to record lessons that they had completed and the occasions that they had surfed the Internet for information or when they had had engaged in interactive exercises. In addition, the class teacher kept behavioral score sheets for each of the pupils in this particular class. The behavioral score sheets simply kept a simple record of any notable change in behavior of the pupils. For example, if a pupil who had been passive in class is now able to respond to teacher questions and answer some of the questions, is deemed to be active in class. Similarly, if pupils who had been shy to answer are now able to answer questions are considered to have 'come out of their shell' and participate in classroom activities. In a way, frequent use of VELT had helped in emotional and personality development of pupils. In this first level or step, students are asked to evaluate the use of VELT. These are sometimes called smile sheets or happy sheets because in their simplest form they measure how well students liked the lessons or a particular training. Level Two measures learning results. To show achievement, have students complete a pre-test and post-test, making sure that test items or questions are truly written to the learning objectives. By summarizing the scores of all students, trainers can accurately see the impact that the training intervention or VELT lessons had on them. Level Three evaluations attempt to answer whether or not students' behaviors actually change as a result of new learning. Observation surveys are used, sometimes called behavioral scorecards. Surveys can be completed by the student's supervisor or teacher. A survey questionnaire was administered to the 29 pupils in this class. Simple questions were asked pertaining to the usage of the interactive lessons in VELT. Pupils filled in the questionnaire during the first week of November 2005 (i.e. at the end of nine months). All the 29 sets of questionnaires were duly collected and subsequently the responses from the survey were recorded and analyzed using the Statistical Package for the Social Sciences (SPSS) Version 12.0. The results of the questionnaire analysis as depicted in Table 1 showed some striking findings on the type of infrastructure support that pupils have in suburban areas in Malaysia. The analysis showed that only 21 pupils (72.4%) out of a total of 29 had computers with Internet facilities at home. Out of these 21 pupils, 19 pupils had broadband Internet access facilities. The survey analysis further showed that almost all the pupils liked and enjoyed the lessons embedded in VELT. However, only 18 pupils (approximately 68.9%) did the activities given in the hyperlinks. Since some pupils did not have broadband Internet access at home it was hoped that those pupils would use the school computer laboratory in the afternoon. The questionnaire analysis reflected that some students (i.e. 10 students) came to school often to do the VELT lessons. In fact, pupils were encouraged to frequently use VELT as they could obtain free on-line support from their tutor. If yes, do you have a computer with Internet access? Do you often follow the VELT lessons at home? Do you like the VELT lessons? Do you open the hyperlinks given in the lessons? Do you come to school in the afternoon to do VELT lessons in the computer laboratory? Do you have a headset with microphone facilities? Have you carried out an audio conferencing tutorial with your VELT tutor? Have you carried out video conferencing tutorial with your VELT tutor? Do you think doing more VELT lessons can help you to improve your English communication skills? During the span of nine months, only 10 (approximately 34.5%) out of 29 pupils did audio conferencing with a tutor of their choice. Almost all the pupils agreed that doing more VELT lessons could help them to improve their aural-oral skills. The pupils were asked to jot down in a notebook whenever they did the VELT lessons. They also wrote down the addresses of the websites they visited. In this case study hypothesis testing was carried out. A statistical hypothesis is a conjecture about a population parameter. This conjecture may or may not be true. Z statistical rest is usually done for the mean of a large sample but if the sample size is below 30 then a t test is done (Bluman, 2007). A paired-samples t test procedure was used to test the null hypothesis and the alternative hypothesis for the controlled and the experimental class. The data consist of two measurements taken on the same subject and the t-test was carried out for both the controlled and the experimental class. In the controlled class normal teaching was carried out. None of the ICT integrated and interactive lessons embedded in VELT were used. In late February 2005 a test which included listening comprehension and an oral component was administered to this class and the mean scores were measured. In late October 2005 another English test that included listening comprehension and an oral component was administered and once again the mean scores were recorded. The oral test was held on a different day and the marks added to the main test. The tests that were carried out for the controlled and the experimental class were standardized meaning that the same questions that tested a set of skills were administered to both the classes. The statistical output for the paired-samples t test is given below. The paired samples statistics as depicted in Table 2 compares the Mean, N, Standard Deviation, and Standard Error of the Mean for each of the variable that is given. Table 3 depicts the paired samples correlations. Since the two variables namely the February test and the October test represent the same class at different times, the correlation is fairly high (i.e. 0.800) and the significance value low (0.000). The paired samples t-test procedure as depicted in Table 4 compares the means in the pre and post test situation. The mean difference of Ð 0.82759 is what is actually being tested against zero. This can be considered as negligible as the mean difference is rather small (< 1). The result is insignificant as t =0 .891 and p = 0.380. Since the significance value is high i.e. 0.380, then we cannot conclude that there is a significant difference between the means of the two variables. Therefore for the controlled class, the null hypothesis holds in favor of the alternative (Ho: md = 0). In the experimental class, ICT integrated activities were carried out during classroom teaching and learning. In addition to this, pupils in this class frequently did the interactive lessons embedded in VELT after school hours. Audio and sometimes video conferencing activities were carried between the pupils and online tutors. In late February 2005 a test which included listening comprehension and an oral component was administered to this class and the mean scores were measured. In late October 2005 another English test that included listening comprehension and an oral component was administered and once again the mean scores were recorded. The oral test was held on a different day and the marks added to the main test. The statistical output for the paired-samples t test is given below. Table 5 depicts the paired samples statistics while Table 6 depicts the correlations for the Experimental Class. The paired samples t-test procedure as depicted in Table 7 compares the means in the pre and post test situation. The mean difference of Ð -7.828 is what is actually being tested against zero. This mean difference is significant as the mean difference is greater than one (i.e. value is >1). The result is significant as t = -3.665 and p = .001. A low significance value for the t test (typically less than 0.05) indicates that there is a significant difference in the performance of the class before and after VELT was introduced in terms of their English proficiency and communication skills. Therefore for the experimental class, the null hypothesis is rejected in favor of the alternative (i.e. H1: md 0). Furthermore, the probability of making a type 1 error is controlled by using a maximum allowable value of Alpha (usually 0.05 for 95% confidence interval) and this affirms that it is a correct decision. Table 8 depicts the summary of the results for the controlled group. The summary revealed that improvement in the attainment level in English language was minimal. Appendix A shows the full list of names of the pupils in the controlled group together with their marks. The summary of the grades obtained by pupils in the experimental class revealed that there was some notable difference in performance after VELT was introduced. Six of the students had now obtained grade A and there were no failures (i.e. no one obtained D which is deemed as 'Fail'). Appendix B shows the full list of names of the pupils in the experimental group together with their marks. The purpose of the Level Three evaluation is an attempt to answer whether or not students' behavior actually changed as a result of new learning by using the VELT interactive lessons and audio conferencing tools. The Year 5 experimental class teacher in this case study had been asked to observe and record changes in pupils' behavior during the nine months of using VELT lessons. The behavioral score sheets kept by the experimental class teacher as depicted in Appendix C in fact revealed some changes in pupils' behavior. The class teacher noticed that 17 of the pupils who had actively used the VELT lessons had become more active during the English lessons. Previously these 17 pupils were quiet but now they were taking a more active role in individual and group activities. A summary of the score sheet kept by the teacher of the experimental class is shown in Appendix C.
The entries made by pupils into their pocket notebooks revealed that pupils generally followed the VELT lessons frequently. Audio conferencing was used only by 10 pupils and only 3 pupils had web cameras. This was quite puzzling and not an encouraging trend as 19 out of the 29 pupils had broadband Internet access. To find out what was wrong, the authors visited and interviewed nineteen out of twenty-nine pupils as well as the class teacher who took part in this research study to verify the responses. It was indeed a Herculean task to interview the pupils whose homes were in different locations. A total offive questions were asked during the in-depth interviews. The questions that were asked were as follows: (a) Can you tell me why audio conferencing was not carried out frequently? (b) Do you have a web camera? (c) What kind of help do you get from your online VELT tutor? (d) Do you find the audio and video conferencing sessions useful? (e) Do you have any problem regarding Internet connection? The primary motive for conducting the interviews was to find out the poor response rate on audio conferencing sessions and to affirm if the audio conferencing sessions were useful to the pupils. Each of the interview session lasted for about twenty minutes. An in-depth interview is a dialogue between a skilled interviewer and an interviewee. Its goal is to elicit rich, detailed material that can be used in analysis (Lofland and Lofland, 1995). In-depth interviews also encourage capturing of respondents' perceptions in their own words, a very desirable strategy in qualitative data collection. With the permission of the participants interview data was recorded on tape and summarized in notes. The interviews were later transcribed and then analyzed using a coding process (Miles & Huberman,1994). During the in-depth interviews, the interviewer often had to prompt the interviewee with other short questions. The qualitative data obtained were coded by using labels and meaning to pieces of information. The coding enabled the author to organize large amounts of text and discover patterns that would be difficult to detect by reading alone. Initial and focused coding were used to review codes and eliminate less useful ones, combine smaller categories into larger ones and organize codes into larger themes that connect different codes. In other words, the mass of data obtained were meaningfully reduced. The codes were based on key themes and concepts that were present in the data. The results of the study were then verified by showing them to the interviewees and asking them if the interviewer had accurately recorded what they meant. This was done to increase the study's reliability and validity. Only after having done this, conclusions were drawn. Sample data display matrix for two students on the process of initial and focused coding are depicted in Appendix D. A wealth of information was collected from the interviews and the descriptive codes were organized into four main themes. Table 10 depicts a summary of the interview findings. There is a need for parents to play a positive role in aiding their children to obtain better communication skills. With better family support, more audio conferencing could be carried out. Home support is crucial in the teaching and learning process and parental support is vital in the education of a child. The support and cooperation of families in improving the children's education has been accentuated by Epstein and Becker (1982). There is further a need to provide hands-on training to pupils on ways of rectifying minor technical problems. Many parents were not supportive of audio and video conferencing. Another reason for the low audio conferencing is that the pupils did not know how to rectify minor technical problems. The students were mainly from poor families and hence they could not afford to buy a web camera. Only three pupils had web cameras. Pupils felt that they now have the confidence to talk to others and they could understand what the other person is talking. They visibly feel that they are improving as more conversations were carried out. Often there appears to be problems with the broadband service provider. The bulk of over 90% of broadband users in Malaysia subscribe to the TMNet Streamyx packages. Many pupils had complained that there had been interruptions in the middle of conversations. There is a need to further improve the broadband service. As depicted in Table 11 the Internet penetration rate is steadily improving with 13.5 million users in 2007. Broadband speed in South Korea and in Hong Kong is now 1,000 megabits per second. Malaysia's broadband speed still lags behind with a speed that ranges between 1Mbps and 4Mbps. On 16th of May 2008 it was announced in the Star Newspaper that Telekom Malaysia Bhd and the Government of Malaysia are going to spend a total of RM15.6 billion to ensure that the country will have a top-notch, competitive high-speed broadband infrastructure in the next decade (thestar.com.my). This augurs well for better e-learning in the near future. Most schools have a server and this means that there is an intranet in the school. Pupils however say that they are unable to enter the school server from home. School servers in Malaysia are shut down after office hours i.e. after 5.00 p.m. This implies that the potential gains that can be derived from a school intranet have not been exploited. If a school has developed a range of resources based on a particular theme, then there may be many opportunities for that content to be shared with other schools through intranets (Heppell, 1999). The authors would like to suggest that an integrated network involving schools throughout the country be established and this should be accessible by both students and parents beyond the school time. Presently only diagnostic test marks are entered into the database for the purposes of determining the entry level of users. It would be a good idea to enable the system to enter the marks of all exercises in the VELT lessons into the MySQL database. In this way, the system should be able to track the progress of individual students and print reports if necessary. Another limitation is that the diagnostic tests are in the form of multiple-choice questions and written using spreadsheet. It takes a while for students to type in the answers. The system can be enhanced if the tests are constructed in HTML design using radio buttons. Selection of answers would be more efficient. There is an absence of a discussion board in this system. A discussion board or corner ought to be added for comments and discussions on the lessons and to allow communication between the students and between students and tutors. Another limitation of VELT is that the audio/video conversation is done outside the system. Students need to have Yahoo Messenger or Skype to carry our audio and video conferencing. The system should allow teachers to upload interesting and interactive lessons and exercises which had been proven to be exemplary and highly successful. This would mean extending the administrative rights to selected teachers by providing them uploading facilities. The performance of the Year 5 pupils in the experimental class in terms of academic gains as well as on enhancing their oral skills was very encouraging. However this performance would have been better if there had been more support from parents. Audio and video conferencing between teachers and students and between learners of English Language have a great potential in English Language teaching and learning. Instant Messaging Tools in particular audio and video conferencing tools are free of charge. These tools should be fully exploited by English Language teachers in Malaysia to uplift English communication skills. This study further calls for dedication and sacrifice from serving teachers to encourage pupils to have conversations with their English Language teachers beyond their classroom. Asmah, Haji Omar (1981). 'The roles of English in Malaysia in the context of national language planning'. Proceedings of the Regional Seminar on Varieties of English and their implications for English Language Teaching in Southeast Asia. Singapore: RELC. Bluman, A. G. (2007). Elementary Statistics. A Step by Step Approach. ( Sixth Edition) McGraw-Hill International Edition, McGraw-Hill. Pg 393. Carmen et al. (2003). Use of ICTs and the Perception of E-Learning among University Students: A Differential Perspective according to Gender and Degree Year Group in Interactive Educational Multimedia, No 7 (October 2003) pp 13 - 28. Chee, Choy S & Salah Troudi (2006). 'An Investigation into the Changes in Perceptions of and Attitudes Towards Learning English in a Malaysian College' in International Journal of Teaching and Learning in Higher Education 2006, Volume 18, Number 2, pp 120-130. Epstein, J.L. and Becker, H. (1982). 'Teachers reported Practices of Parent Involvement: Problems and Possibilities'. Elementary School Journal 82(2): pp 103-114. Fairus Bin Leman (2003): Problems in Learning English in Rural Secondary Schools: A Case Study. Faculty of Education, University Kebangsaan Malaysia. Unpublished MA Thesis. Fauziah, H. and Nita F.S (2002). Why aren't Students Proficient in ESL: The Teachers' Perspective: The English Teacher Volume XXVIII, June 2002. Gaudart, Hyacinth (1987), 'English Language Teaching in Malaysia: A Historical Account' in The English Teacher Volume XVI December 1987: pg 5. Hussein, et al. (2002): 'Sustaining Interest in Learning English and Increasing the Motivation to Learn English: An Enrichment Program. Paper presented in 'The Millennium MICELT 2002, 3rd Malaysian International Conference for English Language Teaching' – organized by Universiti Putra Malaysia. Khairiah Ahmad (1970). 'Factors influencing the learning of English Language in selected Malay medium schools in Malaysia' – A Research proposal. Jurnal Pendidikan, Universiti Malaya: Volume One, Number One, August 1970. Kirkpatrick, D. L. (1979). Techniques for evaluating training programs. In D. P. Ely & Plomp T. (Eds. ), Classic Writings on Instructional Technology (Vol. 1, pp. 231 – 241). Englewood: Libraries Unlimited, Inc.
Koehler, M. J., Mishra, P. (2005).What happens when teachers design educational technology? The development of Technological Pedagogical Content Knowledge., Journal of Educational Computing Research, 32 (2), pp 131-152. Krashen, S.D. (1976). 'Formal and Informal Linguistic Environments in Language Learning and Language Acquisition'. TESOL Quarterly, 10, pp 157 – 168. Lofland, J., and Lofland, L.H. (1995). Analyzing Social Settings: A Guide to Qualitative Observation and Analysis, 3rd Ed. Belmont, CA: Wadsworth. Lyle, S. (1993). 'An investigation into ways in which children talk themselves into meaning'. Language and Education, 7(3): pp 181-187. Miles, M.B., and Huberman, A.M. (1994). Qualitative Data Analysis: An Expanded Sourcebook. Thousand Oaks, CA: Sage. Nurita Juhdi, Ainon Jauhariah and Shaharudin Yunus (2006), 'A study of employability skills of university graduates' in The Business Wallpaper, Volume 2 Issue I, 2007. Pillay, H. (1995). Fragments of a vision: A case study of the implementation of an English language curriculum programme in five Malaysian secondary schools. Unpublished Ph.D. dissertation, University of East Anglia. School Certificate Attainment Report (2005). Ministry of Education, Malaysia (Laporan Prestasi SPM, 2004 Pengarah Peperiksaan, Kementerian Pendidikan Malaysia) . Zhang, H. & Kortner, N. (1995). 'Oral Language Development across the Curriculum'. ERIC Digests. Retrieved from http://www.ed.gov./databases/ERIC_Digests/ed389029.htmon 20th June 2007. 'Billion-ringgit boost for broadband' by Jo Timbuang. Article published in front page of the Star (thestar.com.my) dated Friday 16 May 2008 (intech@the star.com.my).